You might want to defend yourself from robbers or other attackers if you find yourself working long hours or walking your dog late at night. And there’s nothing more at hand than a self-defense keychain for when you’re on the move because you’ll never forget it at home. 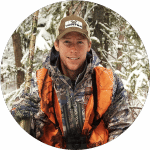 But if you have trouble selecting the right tool for the job, you’ve come to the right place. We’ll tell you all about how to choose among the wide array of such products on the market. After that, we’ll discuss eight amazing products you can consider. Best of all, we’ve synthesized all the important info in the table below. Depending on your purpose and defense style, you can decide which type of weapon appeals to you the most. However, all keychain sort of weapons involve some degree of contact with the person who’s attacking you. 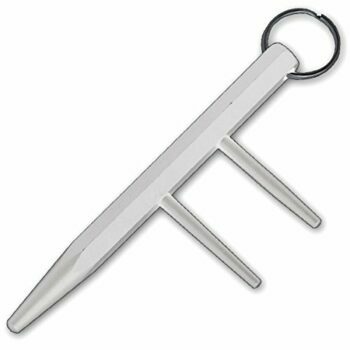 A kubaton key chain is great for hitting and applying pressure if you trust yourself to apply enough force and maintain a prolonged contact with your assailant. On the other hand, a folded knife can be a better decision if you’re the hit and run type. 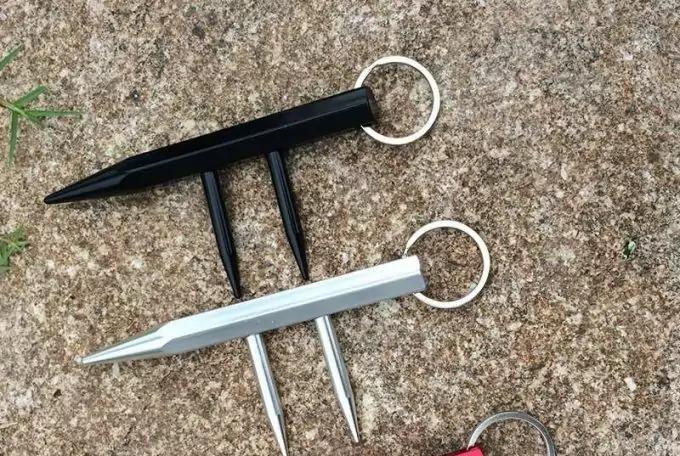 All these keychain weapons are different in terms of the way in which you’re using them. 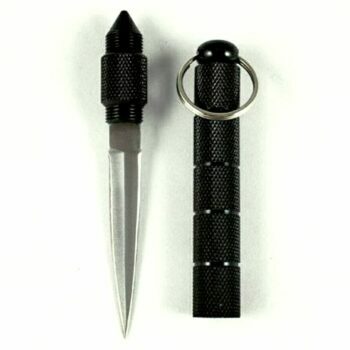 For instance, a kubaton key chain is easy to grab thanks to its ice pick grip, but a knife can be just as easy to grab. The main thing to look after is how fast you can employ the keychain. A knife might need to be taken out of its sheath, and that takes more time than a kubaton weapon. However, some mechanisms are fairly quick if they have a one button use. The grip itself has to be non-slip and comfortable. The reason why you want a spiral grip that’s obviously non-slip is to protect against sweaty palms in tense situations when you have to confront an attacker. But keep in mind that some of these designs might prove completely uncomfortable and actually hurt your hands if you’re squeezing too hard. Regardless of the type of key chain you end up with, you need something manufactured from solid materials. You want your weapon to resist impacts very well, so you can apply the forceful hits or cuts you need. Make sure that if you choose a knife, the blade is sharp and the tip is pointy. In other words, you have to ensure the keychain can be used as a weapon right out of the box. This is essential because it helps you deal really well with different situations that require different reactions. For example, even if you prefer the stab and run option, you might find yourself in a case that requires a hard hit or applying pressure. So in these cases, it’s better to have a personal protection device that can be used either as a knife or as a kubaton weapon. With that in mind, let’s analyze some awesome key chains in terms of these factors, so you can make the best possible decision. We’ve compiled a list of great products, but we’re being objective here, so we’ve also listed their minuses, not just their pluses. That will help you compare and get the device that fits your needs. 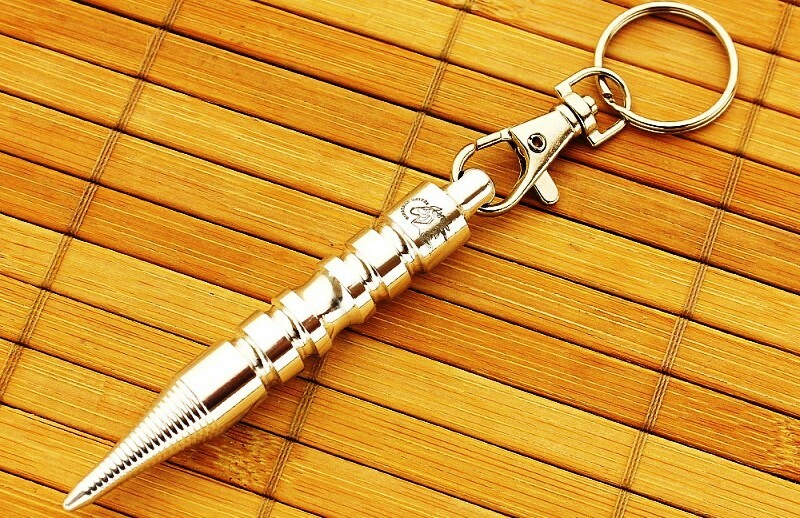 The Doopootoo Defence Kubation Keychain is a kubaton sort of key ring with two different items in the pair: one is a sharp pick, while the other is blunt. They’re both black and have a metal construction, so you can rely on their durability. 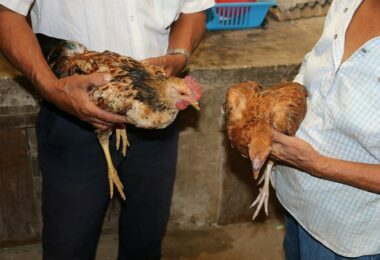 They’re also the right size, and light so they can easily be held in one hand. There are finger grooves on each keychain for a more comfortable grip and more control when you hit something. The sharp one can be used on the softer parts of your attacker’s body, like the eyelids or neck, while the blunt one is better for the bony parts, like their nose bridge or knuckles. And once you have the keys attached, both of these can act like flailing weapons. You can even use them as pressure point weapons, so these are really versatile keychains. On the other hand, some might complain they’re too light to apply enough force and get the job done. Related: We recommend the Sabre Key Pepper Spray Case if you want a self-defense weapon that can be used before you attacker gets really close to you. This pepper spray is powerful enough, it has a key ring that can be detached quickly and you can carry it safely in your pocket. 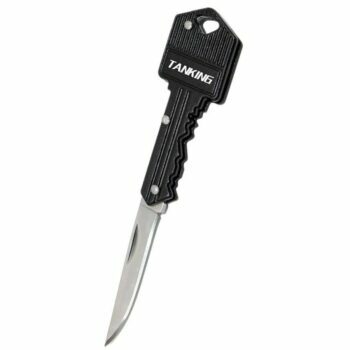 The TANKING Key Knife is a good item for every day uses like opening letters or cutting cardboard boxes, not just for self-defense. The reason is that the knife is very sharp, so you won’t have trouble cutting even thicker materials. Otherwise, in a confrontation with an attacker, you can easily braze them or poke their eyes so you can get them confused enough to run. However, this knife is pretty difficult to open fast, so you have to prepare it with a few seconds in advance. This might not be great for extreme emergencies when each second counts, though. However, you can rely on its quality considering that the materials used are durable and reliable: stainless steel for the blade and aluminum for the handle. 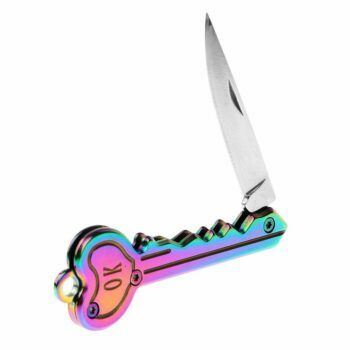 The key disguise makes this knife handy and readily available on your keychain. However, if you get the black color, you can mistake it for one of your regular keys in dim light especially when you’re under pressure. However, the foldable design looks cool and makes it safe for carrying it in your pocket. The MisticalBlades Kubaton Keychain is the perfect kubaton type of weapon for hitting your attacker hard, especially in the bony parts of their body, like the temples or sternum, thanks to its blunt tip. That can immobilize them or even render them unconscious so you have enough time to get away. 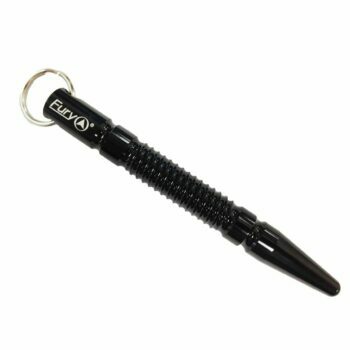 Besides, since it’s heavier than the other kubaton keychain, it will use more force for the blows. The steel construction is what makes it heavier and better for forceful blows, also rendering this keychain durable and resistant to impacts. The hexagonal design adds to this durability, but it’s what gives it a comfortable grip. We also like that the included keyring is made from steel too. There are two threaded prongs so you can get a better grip and make sure the keychain doesn’t slip from your hands even if they’re sweaty. On the other hand, you will only be able to squeeze in one finger between these prongs if you have larger hands, and this design might make it uncomfortable for pocket carrying. The Fury SDK2 Tactical Keychain is a black kubaton sort of keychain, with a blunt tip which makes it perfect as a pressure point weapon. You can use this to inflict quite a degree of pain if you were to push it onto the lower ribs or the inner elbow of your assailant. The included key ring is a plus, so you won’t have to find a new ring of your own to fit this weapon. We love the aircraft grade aluminum design which is very resistant, qualitative and lightweight. That low weight means you won’t be able to use it for forceful impacts, just for applying painful pressure. The spiral screw type of groves offer you good control and grip of this weapon, but they might prove uncomfortable on your hands too. Related: If you like Fury Tactical SDK2, you can always get the original version too, the Fury Tactical SDK Keychain. This comes in a different color, purple, and it has a pressure point as well as a spiral grip for a more comfortable hold. 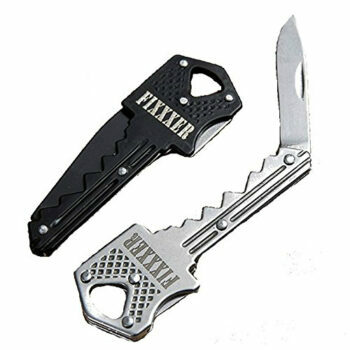 The Fixxxer Key Knife is another sort of concealed blade type of key, which you can attach to your keychain and have handy. Its silver color is great for distinguishing it among your other keys, so you can grab it fast. Besides, the blade sticks out a bit out of the key, so you can easily know which one’s the false key even for the black model. The foldable knife can easily be released by just pushing the button on top, so it can be used fast in emergencies. The safety locking feature is a plus in terms of portability, and we love the stainless steel manufacturing that’s strong and reliable. 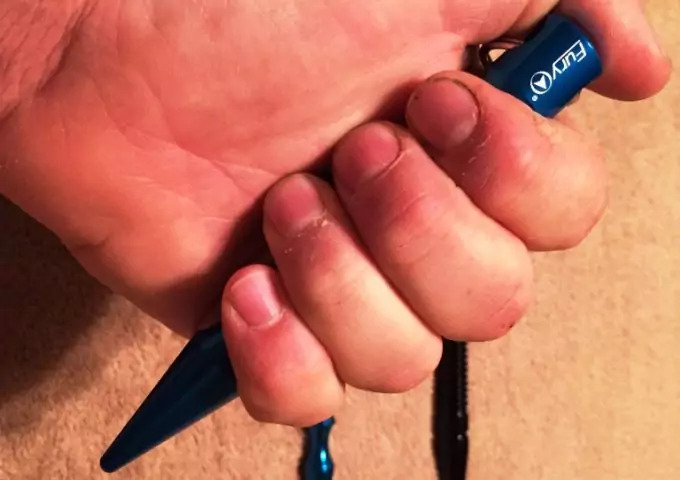 The knife’s tip isn’t that pointy, and it’s not amazing for punctures, though it would inflict quite some pain if you were to push it really hard on a softer part of your attacker’s body. But the blade itself is sharp enough for a deep cut, maybe even a powerful hit thanks to its straight blade. Related: The SABRE Red Lipstick Pepper Spray can go really well with this key knife. It’s also easy to conceal and it’s the perfect gift for a woman who works late night shifts and parks her car in a secluded alley. 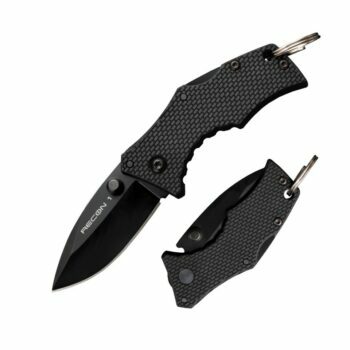 The Cold Steel Micro Recon 1 Folding Knife has a very qualitative construction which we absolutely love. The stainless steel blade has been vacuum heat treated so you know it’s resistant. The blade quality is only surpassed by that of the Griv-Ex handle, with its G-10 laminate scales that offer an incredibly reliable grip. The Tuff-Ex coating applied keeps this knife very sharp and resistant to scratches or other impacts. The Tri-Ad lock is easy to use and great in terms of safety, you can rest assured the knife won’t open up in your pocket. The pocket clip/ keyring is also resistant, being manufactured from stainless steel too. However, this foldable knife has a minimal weight, so it won’t serve for forceful hits. 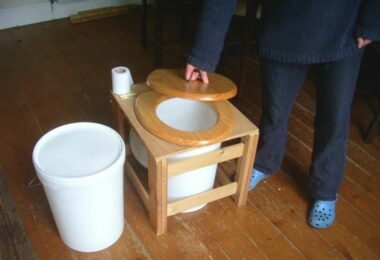 It’s also quite small, so be prepared for that in case you have bigger hands. Related: The Smith’s PP1 Sharpener is something we love for the Cold Steel Tactical Knife because it’s great for sharpening its blade, it’s inexpensive and very resistant. The Huayang Foreveryang Folding Knife is a cool looking knife with a rainbow pattern that makes it easily distinguishable on your key chain. This looks like an ordinary key when you fold it, but a bit of the blade is easy to see. That, along with the unique design, helps you find it fast in emergency situations. The fact that it’s foldable makes it safe for carrying inside your pocket. However, we would have liked a locking mechanism too for additional protection. The knife itself is very sharp and sturdy, and you can use it for everyday chores too, not just personal protection. The total length is good enough for a solid grip. Unfortunately, the sharp edges around the key case make it a bit uncomfortable to hold, though you won’t lose the grip. Related: The SABRE Red Kuros Pepper Spray is a great addition to your arsenal of defense weapons. You can use it against human attackers, as well as stray dogs, and it’s safely guarded in an aqua blue carrying case. 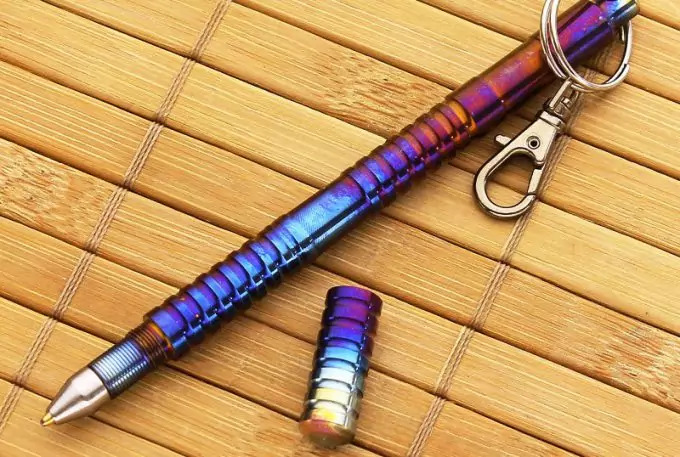 The Eclipse Edge Kubaton Keychain distinguishes itself through the amazing polyresin manufacturing, which is a dense material that renders this key chain fairly durable. We also appreciate the versatile use because you’re actually getting a kubaton tool for hitting and pressure point, as well as a hidden dagger. The knife has a sharp blade, so you can use it very well for cutting and stabbing, considering how powerful it is. However, the unscrewing mechanism takes some time, so it’s not the best under intense pressure when the time is of the essence. 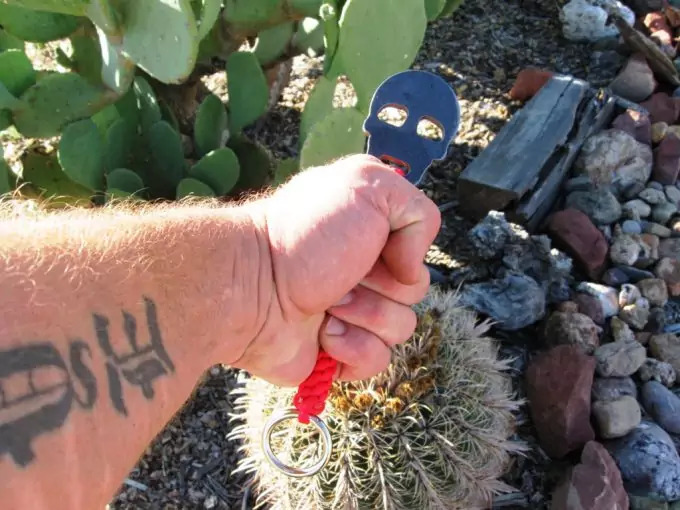 With so many affordable, easy to use and efficient keychain mini-weapons, we’re curious what you’ll decide upon. Will it be a kubaton sort of device like the JCV Black Metal Kubaton Keychain, a foldable knife like the Fixxxer Key Knife, or maybe one that includes both, like the Tactical Kubaton Keychain? Tell us what you prefer and why, we’d love to hear your input. And if there’s any of these products you’ve already tried or another one you think it’s better, drop us a line too!